He was one of the leading haiku poets of Edo during his time, together with Suzuki Michihiko 鈴木道彦 and Natsume Seibi 夏目成美. He was a famous resident of the Senju 千住 district.
. Edo - Senju 千住 Senju district . He used the haiku names 黄雀、東甫、秋香庵、小蓑庵、菜翁. He was the son of the painter Yamamoto 山本龍斎 from Edobashi, Edo. He studied painting also with Kasha Shirao 加舎白雄(かや しらお). 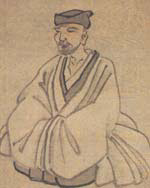 Socho later lived in Shuukoo an 秋香庵（しゅうこうあん）(Autumn fragrance hermitage). He called himself a "Yamato painter" 倭絵師. 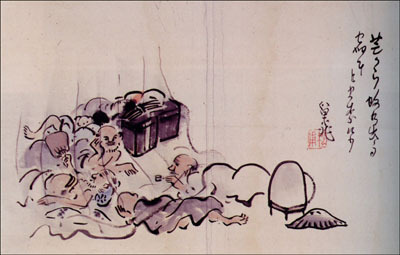 He was later influenced by ukiyo-e style paintings and used a lot of colors in his paintings. 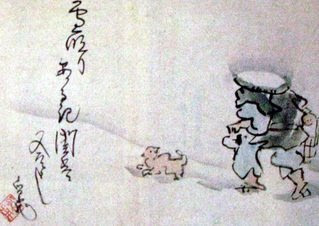 The form of poem-painting called haiga has been a medium of visual expression almost since the emergence of haiku poetry. 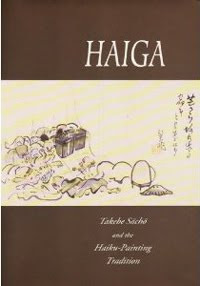 We have no direct evidence of haiga’s first occurrence, but because a great number of haiku represent visual images, and also considering that poems and images in Japan were created with the same brush and ink, it must have been a natural step to add paintings to haiku. However, they are two very distinct forms of expression, with different capabilities and potentials, leading to a number of interesting questions. 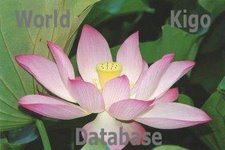 How did Japanese masters reconcile or play upon these differences? Most important, how did the addition of visual images reinforce, add to, or change the meanings of the poems?